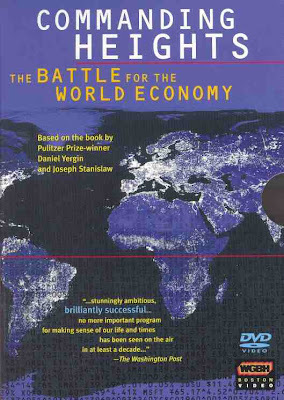 Seven years ago PBS released the outstanding, and incredibly informative, six-hour documentary called Commanding Heights: The Battle for the World Economy. The series, based on the book written by Daniel Yergin and Joseph Stanislaw, follows the trajectory of free markets in the 20th century. Taking its title from a speech given by this guy, Commanding Heights examines capitalism, globalization and the world economy from the early 1900's until the late 1990's. Whenever I am asked to recommend additional resources for teaching economics I always plug the Commanding Heights book and documentary. After reading the book and watching the series you will have a much stronger understanding of the workings of the global economy over the course of the last one hundred years. To supplement the reading and documentary you can also visit the Commanding Heights website. Here you will find lesson plan ideas, video clips, time lines and many other useful bits of information that will help you in the classroom. Show your students the hyperinflation clip on Bolivia and they will have a much greater understanding of the implications of a 50,000% inflation rate.